This article appears in the January 18, 2013 issue  of Executive Intelligence Review. Jan. 10—As 2013 begins, humanity faces the worst economic breakdown crisis that the planet has seen since the 14th-Century New Dark Age. The mega-bailouts of the predatory banks and of the international speculative financial bubble, which began in earnest in 2008, and continue in crescendo up to the present, have only unleashed a hyperinflationary explosion in the entire trans-Atlantic sector, along with cutbacks and austerity imposed in Europe by the hated Troika, which are extinguishing the very existence of nations—as is seen clearly and painfully in the cases of Greece, Portugal, Spain, and others. If not stopped, these policies will only worsen the crisis, bringing Greek-like conditions to the United States and elsewhere. All sensible and moral people admit that the current policies are a disaster, and that we cannot continue along the current path. But almost no one has any idea of the solution, of a rigorous program to solve the problem at its root. In this anguishing situation, a growing international movement has fortunately emerged in favor of the adoption in all countries of the Glass-Steagall law, which President Franklin D. Roosevelt established in the United States in 1933, and which imposes an absolute separation between commercial banking, which issues productive loans, and investment banking, which speculates with private and public funds alike. Initiated by American economist and statesman Lyndon LaRouche, the international calls for Glass-Steagall have spread from the United States, to Russia, to the United Kingdom, to the majority of countries of continental Europe, and to numerous nations in the developing sector, as we document in the attached memorandum and documentation. 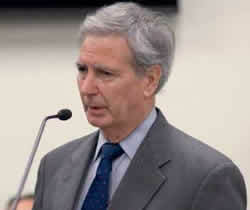 Of particular importance is the fact that, on Jan. 3, 2013, the very day that the 113th Congress of the United States was sworn in, Rep. Marcy Kaptur (D-Ohio), and Rep. Walter Jones (R-N.C.), formally introduced to the House of Representatives H.R. 129, a bill which calls for the re-establishment of the Glass-Steagall law. 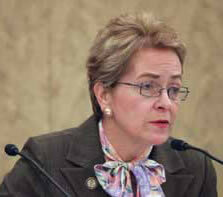 Kaptur had introduced an identical bill, H.R. 1489, in the 112th Congress, which was sponsored by a total of 85 Congressmen, both Democrats and Republicans, although it was never brought to the floor for a vote. With the introduction of H.R. 129, the issue of Glass-Stegall has been placed front and center in the national and international debate. LaRouche has established that the adoption of Glass-Steagall, both in the United States and internationally, is the essential first step to save the international economy from a systemic breakdown. But although it is necessary to immediately implement Glass-Steagall in order to stop the bloodletting, additional measures are required to reactivate the productive economy and create productive employment. In the case of the United States, it is essential to return to a Hamiltonian credit system, with a National Bank that issues new productive credit (see EIR, Dec. 14, 2012); and great scientific and infrastructure projects must be set in motion, such as the North American Water and Power Alliance (NAWAPA XXI). These three programmatic points must go together to provide a solution to the current systemic crisis. "The reconstruction of the real economy should be facilitated through long-term treaties of cooperation between sovereign nation-states, which would launch well-defined infrastructure and development projects in the context of the Mediterranean plan for an Economic Miracle, seen as a necessary extension of the Eurasian Land-Bridge. These contracts represent a de facto new credit system, a New Bretton Woods system, in the tradition of Franklin D. Roosevelt." In the case of developing-sector countries, in addition to Glass-Steagall, additional steps are required which are similar to those mentioned above for Europe, with the exception of 1 and 2. If you want to have a future for yourself, your children, and your nation, make sure that 2013 is the Year of Glass-Steagall. 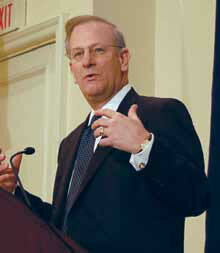 Thomas M. Hoenig, Vice-Chairman of the Federal Deposit Insurance Corporation, urged that the problem of "too big to fail" banks be solved by removing the "safety net" of Federal insurance from non-bank activities, since without it, the largest banks will shrink drastically, as investors demand that these banks hold stronger assets, in an article today in American Banker newsletter. Hoenig writes, "For decades the principle of limited subsidy was understood and practiced. The Glass-Steagall Act kept commercial banks and the government safety net separate from investment banking and broker-dealer activities. Just as importantly, investment banks were kept separate from the payments system and from funding their activities with insured deposits." This system served the United States from the Great Depression until 1999, when the passage of Gramm-Leach-Bliley Act officially ended the separation of activities, Hoenig writes. There have been calls to break up the largest banks, and place the non-bank broker-dealer activities in separate companies to compete for public investment. Would they remain "too big to fail" if that were done? Hoenig answers, "The short answer is no. Structured correctly and without a government backstop, the market would demand stronger capital and safer asset growth. This in turn would enhance the ability to place them into bankruptcy instead of the arms of the taxpayer, should they run into trouble." The safety net is essential to meeting the liquidity demands of the payments and clearing system, Hoenig explains. But, it creates a "moral hazard," because creditors worry less about getting their money back, and a firm's financial condition—a problem which intensifies as firms become larger, and add other activities which enjoy the safety net: "Subsidizing noncore banking activities such as underwriting, proprietary trading, market making, and derivatives encourages firms to bring these business lines onto their balance sheets using more debt, most of which is very short term. The effect is to make the financial system increasingly fragile, and it it becomes proportionately more difficult to allow these firms to fail." "Thus, to realistically address the problem of too-big-to-fail, these activities must again be separated. Commercial banking companies should be confined to operating the payments system and engaging in lending and traditional activities that follow from this basic role...At the same time, placing broker-dealer activities outside of the safety net will reduce the direct risk to the taxpayer and lower the multibillion dollar subsidy that economists now estimate these activities currently enjoy," writes Hoenig. All other activities may continue by broker-dealers, but firms that run into trouble would be much more likely to be resolved through bankruptcy, without a big impact on the economy, as when Drexel-Burnham failed in 1990. American Banker is a New York-based daily trade newspaper covering the financial services industry, with 50 reporters in 6 cities. It is published in print 4 days a week, and online only on Friday. Its website receives 560,000 hits per month. Dallas Fed President Richard Fisher Calls for End to Bailout of "Shadow Banking"
Fisher went so far as to propose that, "To reinforce the statute and its credibility, every customer, creditor and counterparty of every shadow banking affiliate and of the senior holding company would be required to agree to and sign a new covenant, a simple disclosure statement that acknowledges their unprotected status." He even presented a sample disclosure statement, like a health warning on a cigarette package, which would warn that investment and other speculative banking activities were entirely at the risk of the individual investor — not the government. "WARNING: Conducting business with this affiliate of the ____________ bank holding company carries NO federal deposit insurance or other federal government protection or guarantees. I,____________, fully understand that in conducting business with ____________ banking affiliate, I have NO federal deposit insurance or other federal government protection or guarantees, and my investment is totally at risk." As has been the case in several previous speeches, Fisher's attacks on the unending bailout approach, adopted following the September 2008 crash of Lehman Brothers and the near-meltdown of the system, include a relatively sharp analysis of the problems with the ongoing policy, as introduced by Ben Bernanke during the administration of Bush, Jr., and extended by the Obama Administration; and Fisher includes an accurate critique of the Dodd-Frank legislation, which he describes as counterproductive, working against the core problem it seeks to address. In opening his speech, given before the Committee for the Republic, Fisher denounced "the injustice of being held hostage to large financial institutions considered 'too big to fail'...." He added, referring to their "privileged" status, that these institutions "exact an unfair tax upon the American people. Moreover, they interfere with the transmission of monetary policy and inhibit the advancement of our nation's economic prosperity." The bulk of his presentation was an elaboration of both what he calls the "pathology of TBTF," and how Dodd-Frank "has made things worse, not better." These TBTF institutions became the "enablers of a financial tsunami," and they and their related shadow banking system have been protected, he correctly argues, but the protection of them, through "accomodative monetary policy" and has "brought economic growth to a standstill and spread their sickness to the rest of the banking system." Further, Fisher quoted extensively from Bank of England Glass-Steagall proponent Andrew Haldane, on how Dodd-Frank regulation makes things worse. * A letter to the editor from LaRouche movement organizer Andy Olson was published in Thursday's Daily Globe of Worthington, Minn., under the title "Letter: Reinstate Glass-Steagall legislation." Olson's letter begins, "Wall Street apologist Sen. Amy Klobuchar's justification for her 100-percent voting record for bailouts of Wall Street's gambling debts is regularly defended ..." After describing Sen. Klobuchar's excuses, and referencing a Rolling Stone article on the fraud of the bailout, Olson concludes, "The only remedy that will work is a new bill, H.R. 129, to reinstate Glass-Steagall that was just reintroduced in the 113th Congress. Amy, you and all your bailout apologists are now faced with a choice: Wall Street or the American people." * An article dated January 16 in the Capital Times of Madison, Wisc. by associate editor John Nichols, says newly-elected Sen.Tammy "Baldwin should challenge Obama's Treasury pick." Despite Obama's support of her election, Baldwin should join progressives in asking Jack Lew about the 1999 repeal of Glass-Steagall. One question refers to Sen. Paul Wellstone's concerns at the time about undermining Glass-Steagall with the preceding passage of other financial deregulation laws, and says Baldwin should ask whether Lew, as Clinton's OMB head, had shared those concerns. The second question first cites Sen. Byron Dorgan's remarks during the 1999 Glass-Steagall debate: "I think we will look back in 10 years' time and say we should not have done this but we did because we forgot the lessons of the past, and that that which was true in the 1930s is true in 2010." Nichols says Sen. Baldwin should ask Lew, "In hindsight, considering the banking meltdown, do you think that Dorgan might have been on to something?" * An article by former Asst. Undersec. of the Treasury Paul Craig Roberts, dated January 17, was published on the website American Free Press. In the article, which is an attack on the "fiscal cliff" debate as a "diversion" from the real economic issues, Roberts says, "Prior to financial deregulation, essentially the repeal of the Glass-Steagall Act and the non-regulation of derivatives ... commercial banks "took depositors' deposits and made loans to businesses and consumers and purchased Treasury bonds with any extra reserves. With the repeal of Glass-Steagall these honest commercial banks became gambling casinos ... [Their] bets soon exceeded many times not only U.S. gross domestic product (GDP) but world GDP. Indeed, the gambling bets of JPMorgan Chase Bank alone are equal to world GDP." * A Jan. 16 article on the website of The National Interest, "Will Banks Finally Be Brought To Heel," by John Quiggan, a professor in Australia and at the University of Maryland, describes the outrages and crimes committed by UBS and HSBC, and says it's true that prosecuting them or shutting them down "would bring an end to the financial system as we know it today. To bring the system back under control it would be necessary to break up the big global banks, and in particular to separate retail and investment banking. But this would do no more than restore the situation that prevailed before the financial deregulation policies of the 1980s and 1990s, policies that have produced nothing but disaster." "RETURN TO PRUDENT BANKING ACT OF 2011"
RESOLVED, That the Secretary of State be and he hereby is authorized and directed to transmit duly certified copies of this resolution to the President of the United States, the Senate Majority Leader, the Speaker of the United States House of Representatives, Congressional delegates of each state in the United States of America, and each member of Rhode Island's Congressional Delegation. I am writing to you to request that you add your name as a co-sponsor to H.R. 129, the bill to re-instate the Glass-Steagall law. H.R. 129 is the replacement in the new Congress for H.R.1489, which was introduced last spring by Congresswoman Marcy Kaptur (D-Ohio) and has Republican and Democratic co-sponsors. Glass-Steagall was law for 66 years until its repeal in 1999. Since then, the country has gone into an ever increasing financial spiral, which collapsed in 2007 and 2008, and a new spiral now ruining the nation. The bailouts to Wall Street have totaled $27 trillion or more according to reports from Neal Barofsky, former In spector General of TARP, and have been used to prop up countless hundreds of trillions in derivatives and other Monopoly money paper. Re-imposition of Glass-Steagall will end this monetarist madness once and for all, and return the nation to a credit system. Under our traditional credit system, the government can issue credit to states to rehire unemployed, but urgently needed municipal workers, such as firemen, policemen, teachers, sanitation and others. H.R. 129 Now has 4 co-sponsors.